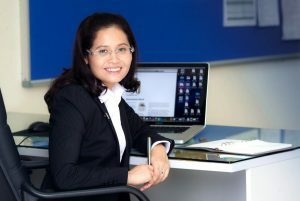 Today’s post on Office 365 was written by Nguyen Thi Minh Thuy, principal at Nguyen Sieu School. As the principal of Nguyen Sieu School, one of the first private schools established in Vietnam, I feel tremendous responsibility to continuously improve the traditions established over the last 25 years, while introducing new approaches. I believe in student-centered learning and an increased emphasis on teaching English. My goal is to retain the traditional values of Vietnamese culture and learning, while equipping students to become global citizens. We have made great strides, becoming the first Vietnamese school to achieve accreditation with Cambridge International Examinations. In so doing, we have joined an international network of schools, which brings opportunities to equip our students with the confidence to compete with their international counterparts. Another way we maximize the capabilities of our students is through implementing better IT tools for teaching and learning. That’s why our students are using Microsoft Office 365 cloud-based communication and collaboration services. Achieving anytime, anywhere learning through online collaboration with teachers and classmates has been an empowering experience for our students. It is a great way to help our graduates to perform successfully in the twenty-first century workplace. We had been using Google Apps for Education for daily operations, but its components were not as integrated as we would have liked for implementing on a large scale across the school. I envisioned digital collaboration between students and teachers as another way to reinforce our school’s caring, supportive atmosphere—our teachers are regarded as the students’ second mothers and fathers—but we never achieved that level of connection using Google Apps. Today, students and teachers collaborate closely in their lessons using Microsoft OneNote and Microsoft SharePoint Online. They store documents in the cloud, downloading them to work with the latest version, on any device, anywhere they have Internet access. We have extended the learning environment beyond the classroom walls—and enhanced our reputation for innovation in education. Our teaching staff and administrators also share ideas with colleagues and stay organized using Office 365 services. Teachers use OneNote to develop lesson plans and everyone prefers the spontaneous exchanges we have on our new social network, Yammer, which is more efficient and private than posting on Facebook. We use Lync Online video conferencing to connect with colleagues in other Cambridge-accredited schools around the world—saving time and money in travel costs. All this began just six months ago, when I and the teaching staff attended a series of workshops at the school hosted by Microsoft Vietnam. That’s when we gained hands-on experience with Office 365. At Nguyen Sieu School, we are proud to have a team of qualified teachers who have a great passion for education and possess a willingness to learn new teaching methods. Office 365 has certainly sparked their enthusiasm for applying IT to their lessons. We began a pilot project at the school in September 2014, with a goal to have approximately 800 of our more than 1,800 students using Office 365 by the end of this academic year. In my job, I get the most satisfaction from watching the students grow, academically and socially. Watching them use Office 365 to gain confidence working with modern technology in all aspects of their lives has been wonderful, for me personally and the entire Nguyen Sieu School community. For more information, read the full story here at Why Microsoft.